The Cutting Edge of Beautiful Page Design. Gadzooks is a collection of 9 gorgeous web pages built with our Harmony Page Building tool. Each page also contains a coordinated Adaptive Menu. One page even contains a gorgeous animated banner image gallery made with Art Gallery Magic. Gadzooks installs into Dreamweaver and comes with an automated user interface. 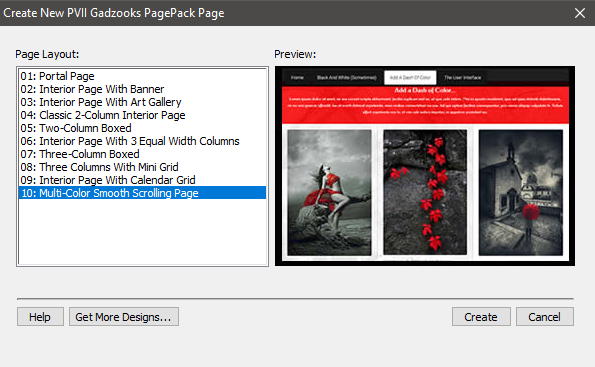 Simply choose a layout, click the Create button, and your page is built instantly. Add your content and graphics and you're ready to publish! Gadzooks and Dreamweaver Templates (DWT) are a match made in heaven. The Template secion in the Gadzooks user guide is amazing! It'll blow you away. Gadzooks comes with an interface that installs into Dreamweaver, giving you the ability to create fully designed pages instantly! Gadzooks comes with 9 page designs. Mix and match portal pages and interior pages. Add a page with a mini animated thumbnail grid. You can even add a responsive calendar page! The Gadzooks Page Pack Collection is an investment in excellence. Harmony Users can Edit each Layout Visually to Restructure Columns and Rows! The PVII Web Forum is a modern browser-based community, accessible to both desktop and mobile devices and requires no additional software or plugins. Project Seven Customer Lists and data are used by Project Seven to communicate with its customers and are never sold or released to outside parties. To be excluded from future product announcements, send an email to: mailto:optout@projectseven.com and include OPTOUT in the subject line. PLEASE DO NOT REPLY TO THIS EMAIL. Direct all inquiries to: support@projectseven.com. Copyright (c) 2018 Project Seven Development. All Rights Reserved.